The University, which has offered engineering courses to women since 1930, offered three challenges relating to wind turbines, roller coasters and computing to the students as part of an ongoing effort to promote STEM industries and boost the number of girls choosing to study in those areas. Professor Shushma Patel, Director of Education and Student Experience for the School of Engineering, said it was important to encourage more young girls to consider engineering as a career as the UK had the lowest percentage of female engineering professionals in the EU, despite proof that companies perform better when they are gender diverse. “It is important to motivate and excite more talented students, in particular young women about engineering,” she said. The celebrations began on Thursday with girls from the South Bank Engineering UTC taking part in a computing challenge. 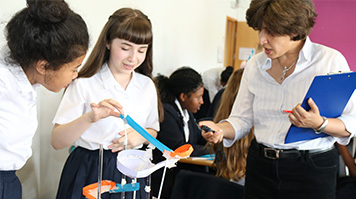 Students from St Ursula’s Convent School, Oasis Academy South Bank and Evelyn Grace Academy also came to LSBU on Friday to take part in various activities delivered in conjunction with the Engineering Development Trust.